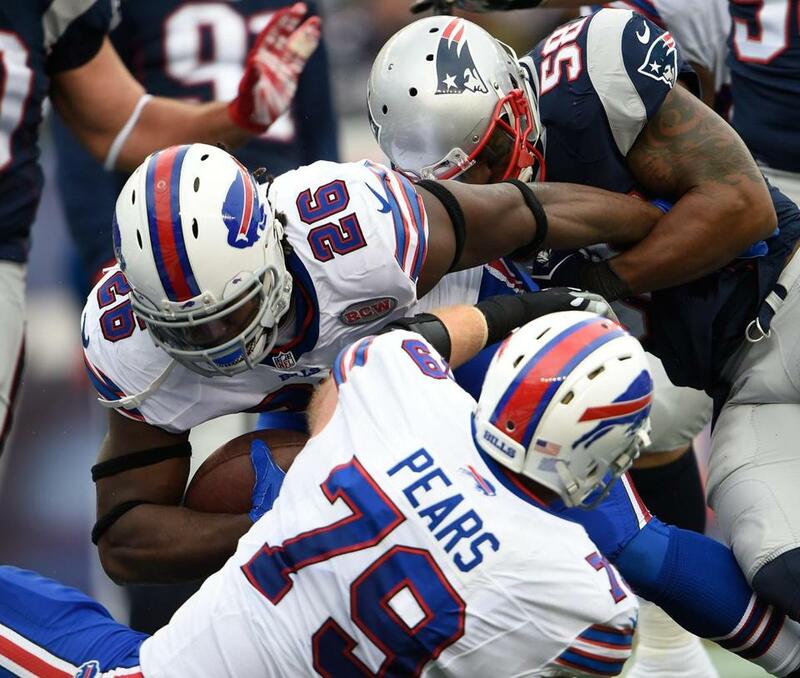 Patriots linebacker Darius Fleming (58) made one of his six tackles in the Week 17 loss to the Bills. Darius Fleming once gave up on football. He was in the sixth grade, suiting up for a Park District team for the first time. Football offers so much promise to the youth of Chicago’s South Side; Fleming thought the game could mean something to him, too. Though eager to learn, Fleming wasn’t given a fair shot. He was stowed away on the bench, relied upon sparingly even in lopsided wins. Lacking a reason to stay, he left the sport. A lingering determination drove Fleming to give the game another try his freshman year of high school. Come to find out, Fleming wasn’t all that bad. By season’s end, he was practicing with one of Chicago’s best high school programs at St. Rita of Cascia. A decade later, following stops with Notre Dame and the 49ers, the 6-foot-2-inch, 255-pound linebacker is putting the final touches on his third NFL season and first with New England, never more confident in his choice to return to the game. But his journey nearly ended before it began. He almost gave up on football a second time to follow another athletic pursuit. Timber lanes and two-toned shoes have long united the Fleming household, a family blessed with far more love than wealth. Fleming’s father, Larry Sr., worked at a steel mill for three decades, laboring to provide his children with every feasible opportunity. He was up with the sun and home by bedtime, though Fleming can’t recall a football game, high school or college, where his father wasn’t cheering from the stands. His mother, Leona Nelson, was never employed, but bore a full-time commitment equal in demand — keeping Fleming and his four older brothers off the streets. They had help. Larry’s sister, Valerie Peeples, whom Fleming credits as another mother figure in his life, boarded horses in the south suburbs. Fleming was with Peeples every weekend to help tend to the stables, especially those of his two horses, Amigo and Stormy. Fleming competed in rodeos from ages 6 to 13. However, while he would always love to ride, he knew riding competitively had an expiration date. Bowling offered more long-term potential. Come his sophomore year at St. Rita, Fleming’s future was at a crossroad. He was getting better at football, but he was much better at bowling. He had bowled a 279 more than a handful of times, and seriously considered transferring to another school with a better bowling team. Fleming elected to stay at St. Rita and, aided by a growth spurt, set the tone defensively as a junior for the 2007 Class 7A champion Mustangs. As a senior, he was selected to the US Army All-American Bowl and committed to a last-second offer from nearby Notre Dame. That winter, Fleming was recognized as Catholic League Bowler of the Year. Fleming appeared in 50 of 51 games for the Irish over four seasons, amassing 158 total tackles and 15 sacks. He was drafted in the fifth round (165th overall) by San Francisco in 2012. He signed a four-year, $2.264 million deal with the 49ers, but failed to play out the contract. Fifteen minutes into his first rookie minicamp, Fleming tore his left anterior cruciate ligament on a non-contact drill. He recovered in time for training camp in 2013, only to suffer the same injury on a non-contact kickoff drill. Forced to embark on his second rehab stint in as many seasons, Fleming didn’t need to look far for inspiration. In the midst of another comeback, Fleming was released by San Francisco last May. Four days later, he was a New England Patriot with a two-year contract. After making the 53-man roster in Week 1, Fleming spent 2½ months on the practice squad as he slowly got back into game shape, both physically and mentally. On Nov. 29, he was added to the active roster. In the regular-season finale against Buffalo, Fleming played his first meaningful defensive snaps in nearly three years. He finished second on the team with six total tackles, and caught the eye of coach Bill Belichick for his play on special teams. While his attention is focused on developing as a football player, Fleming occasionally indulges in what could have been. He still rides horses for pleasure, though far less often so far from home. Every now and then, Fleming shoots up I-495 to bowl in Northborough, now boasting an impressive personal-best of 289. He’s found a group that occasionally needs a substitute. It is how he stays connected with his first true love, though he’s grown quite fond of his full-time passion. There was a time when Fleming gave up on football. Now, he considers it the perfect game.